With a stay at Four Seasons Resort The Biltmore Santa Barbara in Santa Barbara (Montecito), you'll be a 1-minute drive from Butterfly Beach and 7 minutes from Andree Clark Bird Refuge. This 5-star hotel is 2.4 mi (3.9 km) from Santa Barbara Zoo and 5 mi (8 km) from Ty Warner Sea Center. Make yourself at home in one of the 206 air-conditioned rooms featuring minibars and espresso makers. Your pillowtop bed comes with down comforters and premium bedding. 65-inch flat-screen televisions with digital programming provide entertainment, while complimentary wireless Internet access keeps you connected. Private bathrooms with shower/tub combinations feature deep soaking bathtubs and rainfall showerheads. Pamper yourself with a visit to the spa, which offers massages, body treatments, and facials. You're sure to appreciate the recreational amenities, which include 2 outdoor swimming pools, outdoor tennis courts, and a sauna. Additional features at this Colonial hotel include complimentary wireless Internet access, concierge services, and gift shops/newsstands. Grab a bite at Coral Cafe and Bar, one of the hotel's 2 restaurants, or stay in and take advantage of the 24-hour room service. Snacks are also available at the coffee shop/café. Relax with a refreshing drink from the poolside bar or one of the 2 bars/lounges. Full breakfasts are available daily from 7:00 AM to 11:30 AM for a fee. Located directly on Butterfly Beach, this Spanish-style resort features an outdoor swimming pool surrounded by palm trees and ferns. The pool has a hand-tiled bottom and music can be heard underwater. A poolside café is open for lunch, snacks, and beverages. The hotel also has 3 tennis courts available for day and night play, a fitness center, and a beach club. Yoga classes and a spa tub are also available. Four Seasons Resort The Biltmore Santa Barbara has a full-service health spa on site with 11 private treatment rooms, saunas, steam rooms, and a spa tub. Spa menus are based on botanical philosophies and spa services include aromatherapy, massage and body therapies, and hair, nail and cosmetic treatments. There are 2 restaurants and a bar in the hotel offering local and Mediterranean fare and a wide range of wines. Beachside dining is offered for lunch and dinner, and room service is available 24 hours a day. 14,961 square feet (1,390 square meters) of indoor and outdoor function spaces are available, including a beachside venue for weddings. Wedding planning and event catering are both offered by the hotel. For business purposes, 9 meeting rooms are equipped with audiovisual equipment. A business center is also located on site. 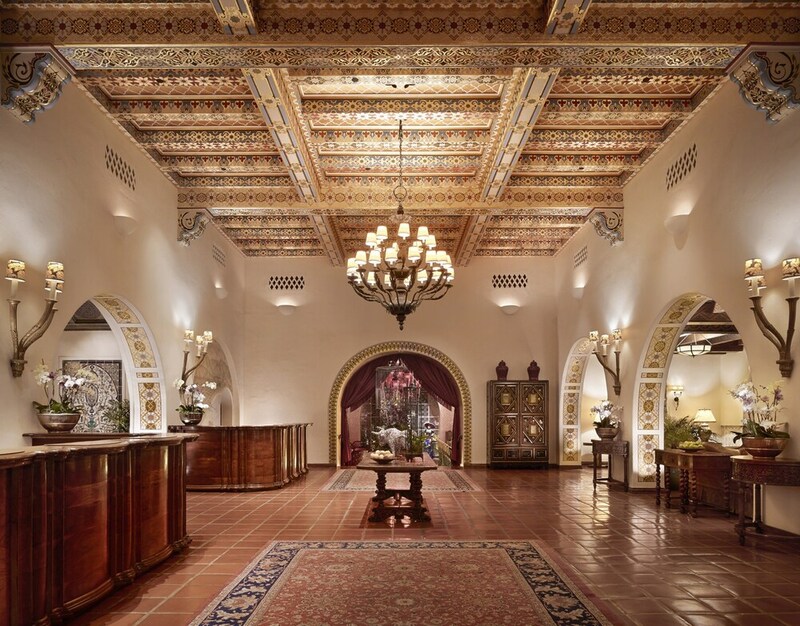 Four Seasons Resort The Biltmore Santa Barbara is a smoke-free property (fines may apply for violations). Onsite self parking and valet parking (surcharge) are available; accessible parking spaces are also available. Bella Vista - Restaurant showcasing organic and local California-Italian cuisine, including house-made pasta, from Executive Chef Marco Fossati. Décor features fireplaces and a hand-carved wine wall, and a heated outdoor terrace offers expansive ocean views. Serves breakfast, lunch, and dinner throughout the week, as well as a renowned Sunday brunch. Tydes - Oceanfront restaurant featuring locally sourced dishes with an emphasis on seafood. Indoor and outdoor seating with panoramic ocean views. Open daily for lunch and dinner. Coral Casino daily access fee may apply. Coral Café and Bar - Pool and beachside dining, offering an all-day menu of grilled items and traditional favorites, including burgers, sandwiches, and salads, as well as appetizers and children's items. Open daily. Coral Casino daily access fee may apply. Ty Lounge - Cozy lounge located on the lobby level with a fireplace, terrace, and ocean views. Serves a variety of cocktails and wines, as well as Spanish-style tapas and sweet treats. Open daily; hours vary. Live music on Wednesday, Friday, and Saturday evenings. Fins - Organic juice bar offering made-to-order juice blends, smoothies, and healthy snacks, including vegan and gluten-free options. Open daily. Coral Casino daily access fee may apply. The spa at the Four Seasons Resort The Biltmore Santa Barbara offers 11 private treatment rooms, including 4 ocean view master suites with French doors, deep-soaking tubs, and fireplaces. A relaxation lounge, steam room, and sauna are also available. Treatments, such as signature massages, body and skin-care rituals, and nail services, are derived from ocean and botanical elements, and are available from 8 AM – 8 PM daily. A resort fee is included in the total price displayed. The property has connecting/adjoining rooms, which are subject to availability and can be requested by contacting the property using the number on the booking confirmation. Some facilities may have restricted access. Guests can contact the property for details using the contact information on the booking confirmation. Guests can arrange to bring pets by contacting the property directly, using the contact information on the booking confirmation.